And first there was the Miami. The Miami thong, synonymous with the brand and its renowned quality and style, has held a special place in the wardrobe of women as it is the original Bernardo style dating back to 1947. Adored and collected by the jetset, Lilly Pulitzer bunch during the 1960’s and 1970’s, the Miami has endured and survived fads and trends as an arbiter of fine style. While the Miami is the staple of the Bernardo collection, new and exciting styles such as the Mistral and Mackenzie are added every season. Fabulously comfortable as stylish with a sun dress or a pair of boyfriend jeans, Bernardo is the classic and iconic sandal for summer. Cynthia Vincent has garnered a strong following of fashion-forward women who love fabulous shoes as mush as herself. This season’s line remains true to her design ethos of giving women shoes that are ” feminine, stylish, comfortable, and most of all original.” With a dedication to fashion and testing the boundaries of trend while keeping comfort primary, Cynthia Vincent has become a favorite of fashion editors and Hollywood stars. Of all the incarnations of gladiator sandals this season, the “Titus” and “Olympia” are the goddesses of this trend. He’s known for fun, flirty and stylish footwear at a very attractive price. After the smashing success and the accolades received for 2008’s “Gilda” sandal, Sam Edelman is at it again with even more comfortable, more stylish sandals. The Greco Sandals, available in understated chestnut and a more vibrant purple, are fabulous buys if you’re looking for the gladiator. Best of all, they’re under $100! The Greco is only one of the many stylish sandals in this season’s line, so check them out! Footnotesonline is happy to announce that they now carry bo’em! A chic, freespirited brand for the woman who has a fashionable mind and discerning eye. She delights in the boe’em’s interplay of artistry and simplicity, high design and natural materials, the causal and luxurious. The new collection features the beautiful bo’em Jezelle and the very sleek bo’em Michelle (in gold and silver). For keeping in basic but beautiful this season, definitely slip into bo’em! A favorite of the sophisticated urban crowd, Theory has imbued the same quality and refinement to footwear that made their clothing internationally acclaimed. The Sabrina is a refined wedge a la Kork-Ease! You’ve grown up, hasn’t your style too? Back to the basics.. While the croco styled leather straps are a slight departure from the typically clean, unembellished finished usually expected from Theory, they work! Made of a leather croco upper with adjustable buckle on strap and comfort is ensured with leather insoles. The wooden wedge is about 3 ½” tall in the back. Diversify your wedges and sandals this season with Theory Sabrina wedges, available in Brown and Grey. Stunning and spectacular! If you’re looking for a true classic, slip into the Sabrina. Because Fall is already on the scene and it’s just barely July 4, I thought it would be a good time to remind everybody that it is still summer and that the season can go on and out with a bang..
So… The quintessential summer thong, Bernardo has remained on the scene with elegance and style ever since Jackie O collected the Miami sandals in every possible color (16). Today, the Miami keeps women just as stylish and polished for summer. It’s no wonder the fitflop has taken on it’s omnipresent 2nd cousin, the flipflop, to become one of the UK’s and America’s hottest summer footwear choices. What else can be said of the evolved flipflop that has been shown in independent university studies to actually increase gluteal muscle response (your bum! ), increase hamstring response, increase thigh and calf response! But what does that all mean? It means you are actually getting a workout by just walking! On top of that, the Fitflop has been engineered to reduce and absorb the shock of walking. The most popular style, the Fitflop Walkstar, is available in Black, Bronze, Silver and Pink at Footnotesonline. Shop for the Fitflop Walkstar at Footnotesonline. Fabulous steals are abound at the Footnotesonline Semi-Annual sale! Now is the time to recharge your Summer style with sleek, sophisticated sandals, pumps, wedges, loafers and more from Stuart Weitzman and more of the hottest designers. It’s easier than ever to find exactly what you want using Footnotesonlie filtered navigation to drill down your search by designer, style, size, color….. Save 30% on Spring 2008 styles and up to 50% on other select styles. Shop Stuart Weitzman Sale! HOT! Kork-Ease cork wedge sandals are back on the streets in style. The Ava II is the must-have style of the season, and just out is the silver metallic croco incarnation of the famous 3″ cork wedge. Set on a 1″ front platform and featuring sleek criss-cross straps with side buckle. 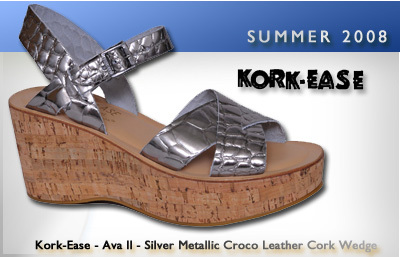 Shop for the sleek Kork-Ease Ava in Silver at Footnotesonline. Summer has officially arrived and whether you are at relaxing at the beach or running errands around town, one summery footwear style is in full blossom – the flipflop. Not long ago, they were rarely seen outside of summer camps or the beach, but they’ve come a long way. These warm weather essentials are available in crocco, bejeweled, fur-lined…. You get the point. The Juicy Couture Caroline is a fabulously glammed out thong featuring a shiny black ornament against a matte black flop emblazoned with the eponymous logo – or is that the flip? Get it while you can.. The Juicy Caroline in Black, Brown or White at Footnotesonline. The quintessential Summer thong, the Jack Rogers Navjo thong has consistently remained in style and fashionable since Jackie ‘O collected them. Silver metallic, bronze/gold metallic or bone/white suede are a small sampling of the dozens of different color and sheen combinations. They look fabulous with jeans, capris or a light summer dress. 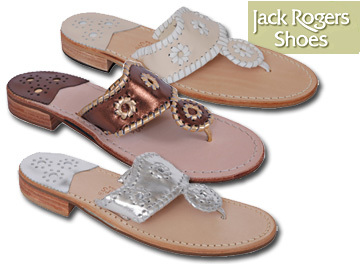 Kick off Summer with a fresh pair of Jack Rogers from Footnotesonline.